After a summer “out of orbit” for re-painting, the Planet Jupiter will return to its spot in the Maine Solar System Model on Friday morning, Oct. 6. Located 5.2 miles from the Sun, which is housed at the University of Maine at Presque Isle, the planet is one of the most easily-spotted features of the Maine Solar System Model, which stretches from UMPI to Topsfield, Maine. Work on the planet took most of the summer, delays mainly due to the busy schedules of local companies that donated labor to complete the project. The entire solar system model, which remains the largest in the Americas, was built by the community of Northern Maine, with participation from many local individuals and companies. Maintenance of the model components will occur through the same process, with a zero budget. McCartney said the model serves as a well-appreciated testament to the Northern Maine community. Everything associated with the solar system model is a community project of many people. The Jupiter site is no exception, with the students of four Aroostook County schools involved in the original construction. The work to take the planet down for maintenance and put it back in “orbit” was done by Langille Construction in Washburn, with transportation to and from Beaulieu’s Garage and Auto Shop in Caribou provided by Dan Robertson. Paint and materials for the recent work on Jupiter was provided by Advance Auto Parts. Mowing the ground around Jupiter and some other planets is done by Larry and Nancy Fletcher of Mars Hill. The entire surface of the planet was recovered in fiberglass and sanded: “We have learned a few things about the effects of weathering here, and I hope that the new cover and paint can last another 25 years,” Jeff Robertson, manager at Beaulieu’s, said. 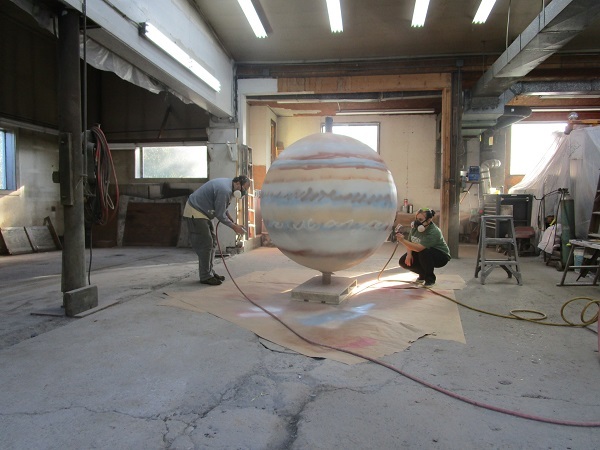 Repair to the globe and initial primer was done by Colin Patterson and Rick Canterbury. Since the house paint that covered the planet for 15 years, as it sat in its spot along Route 1, had not held up very well, the decision was made to use fiberglass, which should last much longer. 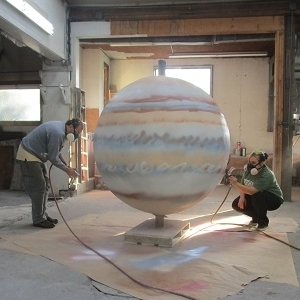 Organization of the repainting of Jupiter was done by Richard and Deborah Jones, members of the Aroostook County Astronomy Club. Additional painting work was done by Christine Akridge, who paints for Shutterbug Studios, and McCartney. “We tried to draw in some of the complicated atmospheric turbidity that characterizes the surface of Jupiter,” Jones said. Special attention was given to the Great Red Spot, which has been known for more than 350 years and takes six days to rotate around the planet. The final clear coats that cover the paint were done by Sam Robertson. Painting Jupiter presents a special challenge, as this planet has perhaps the greatest variation of color, at least seen from a distance: “This banded pattern seems to be connected to the height and temperature of the clouds,” Jim Stepp, local astronomy enthusiast, said. Lighter colored clouds are higher and cooler, with darker clouds being lower and warmer. The planet is covered with storms that show up as red, white and brown spots, often on a white background. Those who painted the planet tried to reproduce that effect. “Tourists are often very curious and want to learn more about the model,” Theresa Fowler, Executive Director of the Central Aroostook Chamber of Commerce, said. “At the Houlton Visitor’s Center, we see a number of tourists who have traveled to the region just to see the Solar System Model,” Kathy Hogan, manager of the center, added. Maintenance to Saturn and Neptune will likely be needed over the next several years, and construction of posts and bases are needed for two more recently recognized dwarf planets, to be located north of Caribou. For more information, about the Maine Solar System Model, contact UMPI’s Community and Media Relations Office at 768-9452 or umpi@maine.edu.